Dewey offered a radical pragmatism, designed not only to offer alternative solutions to the problems addressed by his philosophical contemporaries, but to change the philosophical agenda. 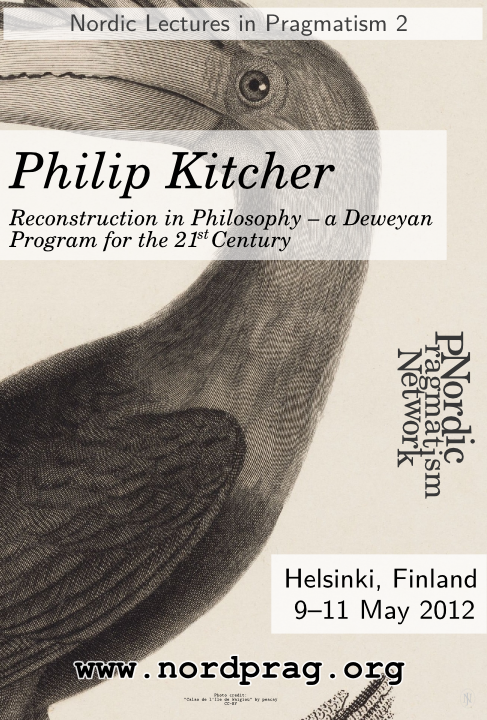 In his lectures, Philip Kitcher will review Dewey’s attempt to renew philosophy, and explore ways in which Dewey’s program might apply in the twenty-first century. He will take seriously Dewey’s conception of philosophical problems as arising in response to the evolving conditions of human life, and of philosophy’s role of synthetic critique. The lectures will range over topics in metaphysics, epistemology, ethics, social and political philosophy, and philosophy of religion. They will draw on Kitcher’s forthcoming collection of essays Preludes to Pragmatism(Oxford University Press, 2012) as well as on material from a book in progress. Philip Kitcher, currently a Fellow at the Wissenschaftskolleg zu Berlin, is the John Dewey Professor of Philosophy at Columbia University. He is the author of books on the philosophy of science, on philosophy of mathematics and philosophy of biology, on science and social issues, and on ethics, as well as on Wagner’s Ring and Joyce’s Finnegans Wake. A former President of the American Philosophical Association (Pacific Division), he is a Fellow of the American Academy of Arts and Sciences. He was the first recipient of the Prometheus Prize, awarded by the American Philosophical Association for lifetime achievement in expanding the frontiers of philosophy and the sciences. His stay in Germany during the current academic year is partially supported by a Humboldt prize. Students from the University of Helsinki are required to enroll to the course using WebOodi. Other participants are required to enroll to the course by sending an email to info@nordprag.org by 1 May 2012. Students can complete the course by participating in a written exam (3 credits) and/or writing essays on themes given at the lectures. Essays should be ca. 8 or 12 pages long (for 2 and 3 credits, respectively, approximately 300 words / page). More information will be given during the lectures. The course can be used for several study units in philosophy subjects at the University of Helsinki. For further information, please see the WebOodi registration page for the course. The course exam will take place at University main building, room 16 (new side) on 23 May 2012 at 14.15-15.45 pm. The exam gives 3 credits, which can be supplemented by writing an essay for 2 credits to yield altogether 5 credits. Students may supplement the exam by an essay for 2 credits or complete the course to receive 5 credits by writing two essays. Essays should be ca. 8 or 12 pages long (for 2 and 3 credits, respectively, approximately 300 words / page). Please send your essays to henrik.rydenfelt(at)helsinki.fi by 10 June 2012. 1. Rorty was essentially right. When a Deweyan critique of traditional philosophy is taken seriously, philosophy comes to an end. As the further elaboration of Kitcher’s neo-pragmatism shows, what is supposed to “continue philosophy” is something entirely different. 2. An evolutionary / pragmatist account of ethics can make no sense of ethical truth. 3. An evolutionary / pragmatist account of ethics inevitably commits the fallacy of inferring values from facts. 4. The principal problems for epistemology, understood as aimed at advancing inquiry, center on the social processes of finding and transmitting new knowledge. 5. Pragmatism must reject the conception of truth as correspondence to reality. 6. Genuine democracy requires social solidarity, understood as a condition of recognizing and responding to the aspirations of others. 7. Free-market capitalism is a precondition for the realization of what Mill and Dewey view as the most fundamental form of freedom. 8. No “religion” that abandons belief in transcendent entities can discharge the functions traditional religions have fulfilled. Secular humanism is inevitably incomplete and unsatisfactory.